As the largest town in the Wimmera, Horsham, 270 km north-west of Melbourne, has been the largest town in the Wimmera since the 1880s. A Lutheran stronghold, it retains most of its late nineteenth and early twentieth century churches and its 1939 Art Deco Town Hall. Its base hospital, TAFE, regional art gallery, aquatic centre, and extensive retailing service the livestock and grain industries of the Wimmera, where most other towns are small, and often in decline. Horsham, a provincial city, is approximately in the middle of the Wimmera region of north-west Victoria. Situated on the Wimmera River, it is 270 km north-west of Melbourne. In 1842 James Darlot took up occupation of a pastoral run in the district where Horsham was later established. He named the run Brighton, probably after the seaside town of Brighton in Sussex, England, where his parents lived. This is also probably the source of the name Horsham, which is a town in Sussex 30 km north-east of Brighton. Darlot persuaded a Melbourne merchant, George Langlands, to establish a store in the Wimmera to supply pastoralists, and Langlands moved there in 1849. There is evidence that the name Horsham was applied to the locality a little before then, and a town survey plan of 1849 shows the name and Langland’s store at the corner of Darlot and Hamilton Streets. The site was described as slightly undulating and subject to inundation during very high floods. Langlands also operated a post office (1849), and the plan also contained mention of an inn, an animal pound, a police watch house and a court house. There is record of a case being tried at the Police Office, Horsham in 1847. Town subdivision lots were sold in 1850. Until the taking up of farm selections and the arrival of the railway (1879) Horsham’s development was limited. A school was opened in 1857, a Presbyterian church in 1860 and a bank in 1868. In 1873 the Horsham Times began publication, and the flour mills were opened. One of them was the beginning of the large chain of mills begun by T.J. Noske (Dimboola) in 1900. It operated until 1971, when it was converted to stock feed production, which continued until 1988 when the mill was badly damaged by fire. The opening of the mills came a year or two after land became available for farm selections. A hospital was opened in 1875, two more banks were opened during 1874-76, the agricultural and pastoral society held its first show in 1876, and Catholic and Anglican churches were built in 1876 and 1877. During the 1870s the Wimmera shire built a pumping station for a town-water supply from the Wimmera River, which was superseded by a gravitation system soon after completion of the Wartook reservoir in the Grampians in 1888. In 1879 the railway was extended from Murtoa to Horsham, and the borough of Horsham was established on 17 November 1882, by severance from the shire. The foundry and implement works, May and Millar, was among the largest in Victoria. 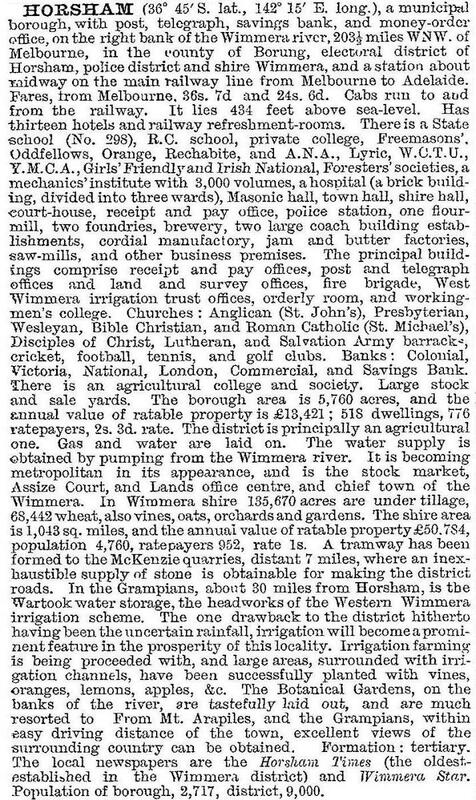 Shortly after this description further town amenities and organisations were established, including an electricity supply (1911), a high school (1912) and a second Lutheran church (1918). Town traders formed a chamber of commerce in about 1920, sewerage was laid on in 1932, a new art deco town hall was built in 1939 and the Wimmera Base Hospital was built in Horsham in 1943. Throughout many of these events the name Langlands is found in lists of trustees and voluntary committees, and the Langlands store was a landmark. It was acquired by the Melbourne department store, Ball and Welch and ceased trading in 1976 when a buyer could not be found for it. Horsham’s regional capital status is reflected in the several motels built there (one on the May and Millar foundry site in 1981) and the large shopping centre. Horsham also has a regional art gallery (transferred to the art deco town hall when a civic centre was built in the 1980s), a racecourse, a wide range of sporting facilities, showgrounds for the annual Horsham show, the Victorian Institute of Dryland Agriculture, a TAFE, a secondary college, a Catholic, Lutheran and three State primary schools, botanic gardens and other reserves beside the Wimmera River, and a high fashion ultra fine wool production farm in which the sheep are housed undercover. The Horsham Theatre (1926) in Pynsent Street is heritage listed. The Horsham council has promoted an industrial estate and in 1999 opened a regional livestock exchange. A large aquatic centre was opened in 2007. 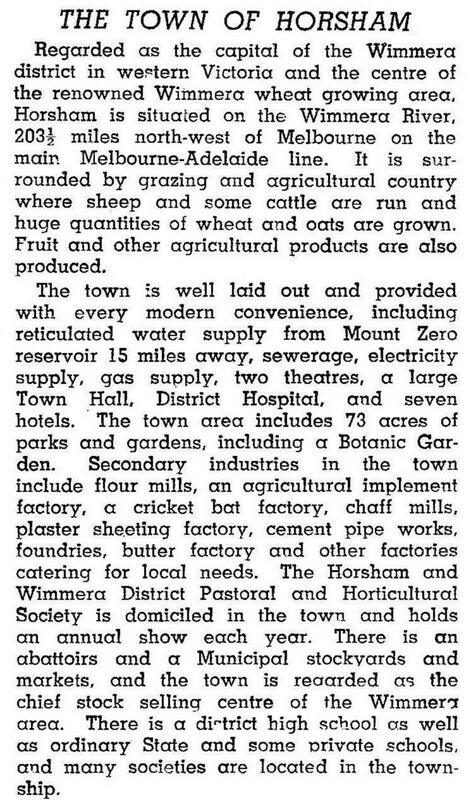 Horsham, which became a municipal town on 16 November 1932 and a city on 25 May 1949, was united with Wimmera and Arapiles shires and part of Kowree shire on 20 January 1995 to become Horsham Rural City. In September 2010 and again in January 2011 many parts of regional Victoria experienced widespread severe flooding. In Horsham floodwaters from the Wimmera River divided the town in two, entering about 10 homes and areas at the centre of town. An emergency relief centre was established at the Horsham Town Hall. Burnt Creek rose high enough to cover several bridges. The steady growth of Horsham’s population shows how it has acted as a ‘sponge’ as rural people have chosen town life over village or farm life.